Emergency responders on the US-Mexico border operate at the edges of two states. They rush patients to hospitals across country lines, tend to the broken bones of migrants who jump over the wall, and put out fires that know no national boundaries. Paramedics and firefighters on both sides of the border are tasked with saving lives and preventing disasters in the harsh terrain at the center of divisive national debates. 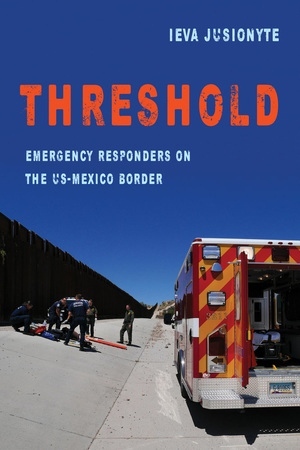 Ieva Jusionyte’s firsthand experience as an emergency responder provides the background for her gripping examination of the politics of injury and rescue in the militarized region surrounding the US-Mexico border. Operating in this area, firefighters and paramedics are torn between their mandate as frontline state actors and their responsibility as professional rescuers, between the limits of law and pull of ethics. From this vantage they witness what unfolds when territorial sovereignty, tactical infrastructure, and the natural environment collide. Jusionyte reveals the binational brotherhood that forms in this crucible to stand in the way of catastrophe. Through beautiful ethnography and a uniquely personal perspective, Threshold provides a new way to understand politicized issues ranging from border security and undocumented migration to public access to healthcare today. Ieva Jusionyte is Assistant Professor of Anthropology and Social Studies at Harvard University and the author of Savage Frontier: Making News and Security on the Argentine Border. She has trained and volunteered as an emergency medical technician, paramedic, and wildland firefighter in Florida, Arizona, and Massachusetts. “The US-Mexico borderland—barren, desolate, fierce—is a teeming terrain, with its desert ‘capillaries circulating life without regard to who is legally entitled to it’: migrants, smugglers of people and of drugs, federal agents. It’s a militarized double war zone (‘drug war,’ ‘war on terror’) and a zone of epic human struggle and tragedy, but it's also a place of breathtaking natural wonders. Ieva Jusionyte’s captivating account of often-collaborating US and Mexican firefighting and rescue units on both sides of the border yields startling and original insights. This beautifully written, lucid book demonstrates how powerfully close observations, precise descriptions, and stories of landscape and people can transmit thought and feeling, and earned knowledge, too.”—Francisco Goldman, author of The Art of Political Murder: Who Killed the Bishop?